Roq Gareau, an early board member, shares his experience as both host and participant in a men’s healing circle, guided by The Circle Way principles. 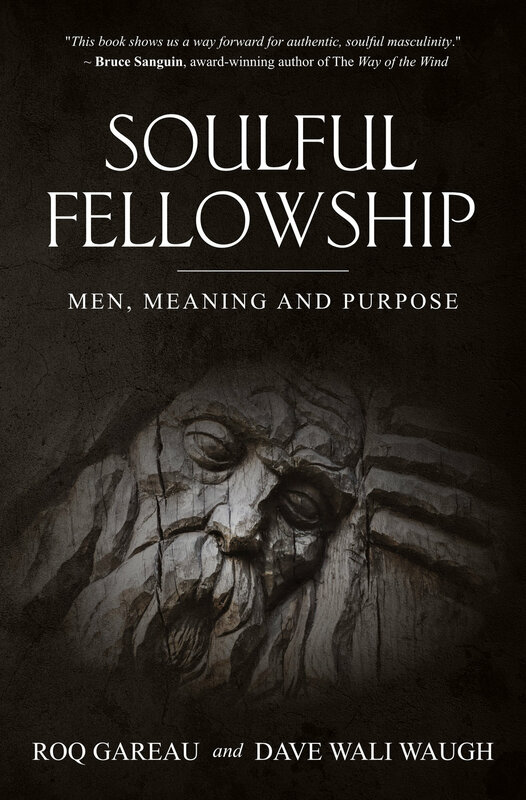 Roq’s powerful narrative is brought to life with excerpts from his first and recently published book, Soulful Fellowship: Men, Meaning and Purpose. I received my apprenticeship in circle with Christina Baldwin and Ann Linnea, starting with the PeerSprirt Circle Practicum, then serving for seven years on the board of directors with the Calling the Circle Foundation – the predecessor of The Circle Way. These days, I work mostly with circles of men in ritual-based men’s groups that focus on healing and initiation. At the centre of my practise is the intention to interrupt contemporary society’s overwhelming patterns of isolation and their undercurrents that can prevent us from growing up. This work is described in the book Soulful Fellowship: Men, Meaning and Purpose, which I co-authored with my friend and mentor, Dave Waugh. Using excerpts from Soulful Fellowship, the following story describes how The Circle Way reveals these outcomes. Modernity has ruled out the sacred. We are looking to be whole in a space that stands divided. Our conditioning has us not seeing the sacred even when it’s staring us in the face. Circle is an old-world technology that allows us to excavate the interior of the self to take inventory of what does or does not belong to us, and what no longer serves. I woke up every weekday at 4:15 a.m. so that I could catch the first ferry into the city. My four-hour, daily commute almost inevitably started and ended in complete darkness – such a contrast to the perpetually-lit city where I worked in a job from which my heart was absent. Time’s sleepless erosion started to incrementally pull me out of the beliefs and comfort barriers within which I had fortified my limited but predictable life of acceptance. During the summer of 2005, my five-year-old daughter got in the habit of waking up in the morning as I left the house. As I walked into the purple dawn, she would yell from the opened bedroom window, “Papa! Don’t go. I love you. Stay home.” On those heart-breaking mornings, with my daughter’s piercing pleas at my back, the neighbours’ horses would nicker softly as I passed. It was as though they were there to affirm the existence of the workhorse in me that laboured to be seen – a workhorse constrained by a harness of social approval. One early September morning, the horses were not there, and my impoverished view of success lost its grip, just for a moment. I turned around and walked to my crying daughter in the window and held her until daylight overtook the night. I didn’t know if I would return to work. I didn’t leave my home island for six weeks straight. During that time, I had the following dream. I drop to my knees, and my hands fall to my side. I look directly into the boy's eyes. I recognize something, and I begin to cry. My daughters push the boy closer to me. We all lock into a single embrace. The room spins from the central growth ring on the floor into a blended smear of colour, light and darkness. I wake up sobbing. When the talking piece got to me, I could feel my heart rate quicken with an anxious fear that had me looking at the ground. I knew that I had to share my dream, but I was terrified. I figured if one man could share his dream without a backlash of judgement from the group, then maybe I could too. I shared the details as I remembered them: the card games on the concentric floor, the dirty, long-haired, dark-skinned toddler entering through the secret passage behind the fridge, the rage, the attempted murder, and the daughter’s plea to recognize my own displaced innocence. Ann and Christina talk about the archetypal energies of circle that are awakened in us when we take our seat on the rim. That enough can elicit a different type of conversation. "Circle signals a much higher degree of participation and a greater sense of exposure." (The Circle Way, p.21) Put that together with the intention of your circle, the quality of hosting, the agreements, and how the participants show up, and you have conditions that support this outcome. Recognizing and exposing my denial of a meaningful and soulful life became an invitation to step within the boundaries of a circle of dignity. The men’s group was an unexpected community that helped shorten the distance between me and the strength inside my vulnerability. My sharing and listening granted me access to poverty-stricken districts of my inner world and membership to a council of soul friends. Hungers of the soul are fed under the shelter of belonging. Fellowship began to restore my own estrangement from my nature. Repressed authenticity has its own innocent loyalty and stealth. The banished self remains waiting to be integrated. The soul remains faithful and alert. The person who asked the question went on to say, “Food is matter, and matter comes from the Latin Mater, which is also the root word for mother.” The man who had shared his dream said, “Yeah, that little guy just wanted to know that he mattered.” It’s when we are afraid that we don’t matter that compensatory measures come into play. Addictions are pain and fear management systems – usually a defence against feelings that we already feel. Beneath the compulsion always resides a genuine wish – usually for connection or belonging. My fellow dreamer hit the nail on the head when he said that my orphaned child needed to know that he mattered. This owning and sharing of our wounds and vulnerabilities is tremendously valuable and generous. Layers of increasing self-revelation in a circle of belonging have a way of melting flash-frozen internal landscapes. There wasn’t a dry eye in the room after the next round of the talking piece. A grief containing sadness and outrage, well expressed by men, feeds a lineage of absent fathers and lost sons, making the hardened hearts of these men more pliable and more available to the people in their lives. An awful price can be paid for superficial cohesion and stability in life – one that deprives the immensity, diversity and deeper longing of the soul. The shallowness of reduced identity makes an orphan of the complexity of soulful innocence. We learn to block access to wildness, banish otherness and destroy vulnerability that we don't understand. It often requires the curiosity and wonder of the child to become reacquainted with the refugees of the inner world. Despite adopted beliefs and deported innocence, a deep longing for self-discovery remains housed within the growth rings of the self. Special blessings and healing reunions remain locked away in a circle of belonging in the softwood forest of the heart. We are restlessly moved by our longing for belonging, which is complex because it arises in the context of a society that reinforces isolation. We aim to return to a community that will see the complexity we carry as a blessing. In circle, we are provided with opportunities for course corrections of past diversions and misplacements. To know fellowship is to come into relationship with a circle of belonging. Soulful Fellowship is a vulnerable and honest, intergenerational dialogue between soulful friends who are part of a fellowship of men. It is written for anyone who wants to live with meaning and purpose, and particularly for men who have lost their spark for life.